The Snowtrac 2 is the ultimate all-round winter tire thanks to the application of Silica Nova 7°C in the tread compound. This gives the tire excellent winter properties as well as a perfect grip on wet and slippery road surfaces. A hard ‘base’ compound is used for the foundation layer, considerably improving handling on dry and wet road surfaces and offering a reduced rolling resistance. The zigzag sipes also play a key role in the way this tire performs in snowy and icy conditions. Taken as a whole, the Snowtrac 2 effortlessly combines top performance on snow and ice with the capacity to reach speeds as high as 118 mph (190 km/h) (T) and 130 mph (210 km/h) (H) (where this is possible and permissible). 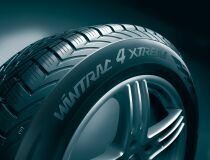 The WINTRAC XTREME is the first winter tire to be developed in partnership with Giugiaro Design. Aggressive, firm lines give the W-shaped tread its powerful appeal. Sipe technology was a priority for Vredestein in the design of the WINTRAC XTREME. Optimum Silica Processing™ (OSP™) technology is incorporated in the fabrication of the tread compound, enhancing the winter performance and improving grip on wet surfaces. In addition, the equal distribution of pressure across the contact area ensures an even wear pattern, whereby low noise levels are assured throughout the tire’s life-span.